Long considered the stuff of science fiction, a prosthetic hand capable of fully replicating all of that appendage’s various functions is closer to becoming reality than ever before. This book provides a comprehensive report on exciting recent developments in hybrid control techniques—one of the most crucial hurdles to be overcome in creating smart prosthetic hands. 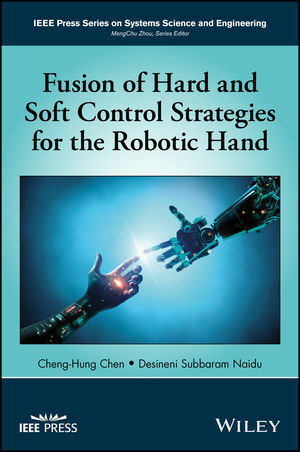 Coauthored by two of the world’s foremost pioneering experts in the field, Fusion of Hard and Soft Control Strategies for Robotic Hand treats robotic hands for multiple applications. Itbegins withan overview of advances in main control techniques that have been made over the past decade before addressing the military context for affordable robotic hand technology with tactile and/or proprioceptive feedback for hand amputees. Kinematics, homogeneous transformations, inverse and differential kinematics, trajectory planning, and dynamic models of two-link thumb and three-link index finger are discussed in detail. The remainder of the book is devoted to the most promising soft computing techniques, particle swarm optimization techniques, and strategies combining hard and soft controls. Fusion of Hard and Soft Control Strategies for Robotic Hand is a must-read for researchers in control engineering, robotic engineering, biomedical sciences and engineering, and rehabilitation engineering. CHENG-HUNG CHEN, PhD2, IEEE Senior Member, is an Applications Engineer at Synova USA in Secaucus, New Jersey, which is Micro-Machining Center of Laser MicroJet© technology. He performs Laser Micro-machining tests to meet customer expectations in industry markets of aerospace, medical healthcare, diamond & jewelry, energy, tool manufacturing, and semiconductor. He holds doctorates in Engineering and Applied Science as well as in the Biological Sciences. DESINENI SUBBARAM NAIDU, PhD, Life Fellow IEEE, is the Minnesota Power Jack F. Rowe Endowed Chair and Professor of Electrical Engineering at the University of Minnesota, Duluth, USA. He pioneered several notable interdisciplinary research projects including Smart Prosthetic Hand Technology at the Measurement and Control Engineering Research Center (MCERC), Idaho State University, Pocatello, Idaho, USA.